In this Android tutorial let us learn, how to create a chart in an Android app using AndroidPlot library. Creating a chart in Android is made simple by AndroidPlot, just we need to know about couple of classes. How to pass values to those classes to plot the chart and then how to style the chart using nice colors, and that’s it chart in Android is done. In this chart example, let us see how to create a XY plot for couple of series. AndroidPlot has array of examples in its demo package which is available for downloand. AndroidPlot library provides option for many different charts like bar, pie, line, scatter, step etcetera. Similar to the number of types of chart, the style customizations provided is also plenty. I haven’t done any comparison study yet on other types of Android charting libraries available. Based on casual Googling I chose AndroidPlot and I find this to be good. 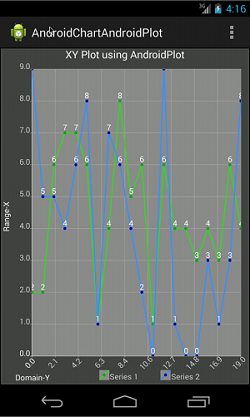 I will write about other Android chart libraries in the future. Download core library from AndroidPlot and add to “libs” folder. Androidplot 0.6.0 is the latest version as of now. Create a custom chart layout and its corresponding design parameters. Create a chart activity using the above layout. This example Android app gives example for XYPlot only. All other charts are very similar to this and just change the chart type API. In this chart example we have created, two line series in X-Y axis. I have used Java’s Random class to generate 20 random numbers ranging from 0 to 10. Using those generated numbers SimpleXYSeries instance is created. Comments on "Android Chart using AndroidPlot"
but i have problem when i run it! is there a way to change background color of this chart? so please any code have please let me know…. This code fails to build. It cannot resolve the 2 xml files, the menu file and the main layout file and the id ‘xyPlot’. Using min SDK 19, target 21, MyEclipse 2014. Can’t imagine sdk versions are implicated. Hello. How can i save the graph?. Comments are closed for "Android Chart using AndroidPlot".